So this week I decided that I’m going to participate in the Road Trip Wednesday over at YA Highway blog. There’s some talented people over there, so I highly suggest you head over there and check them out. But wait, you have to read this post first! This Week’s Topic is: Back to school time! What’s your favorite book that you had to read for a class? Honestly, this is kind of a hard question because I loved many of the books I had to read. While Jane Austen remains my favorite, I have to say that she wasn’t the favorite I read in high school. If I had to choose one book I think I have to go with 1984 by George Orwell (either that or Catcher in the Rye). 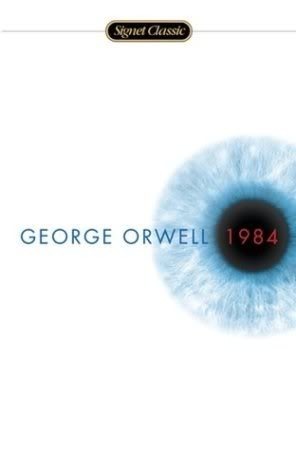 Most people wouldn’t choose 1984 as a favorite book read, but for me it was definitely an experience. Besides steampunk of Jules Verne and H.G. Wells, 1984 was probably the first book I read that had dystopian attributes. I know Verne and Wells are not dystopian, but they wrote about worlds that were different and I read pretty much everything by them. 1984 was a different experience. it was a book that opened up a world that very well could be outside my doors. It’s creepy to read about cameras on the streets as Big Brother watching and realize that there are places around here that have that. end, I was thankful it was part of my reading list. Now, what about you? Do you have a favorite book you had to read in class? Ahh 1984! I haven't read this but I've got it on my kindle – it's on my list!! Oh gosh. LOVED that book. 1984 was my pick too! I was shocked by how much I enjoyed it. I didn't read 1984 at school (I don't recall if it was assigned–if it was, I still didn't read it! ), but I did read it earlier this year. A great book. Very perceptive. And still relevant.